Visitors to the Lambton Room don't often get the opportunity to glimpse behind the vault doors. When they request records to conduct their research, one of our staff members diligently scurries into the back and fetches the necessary files. 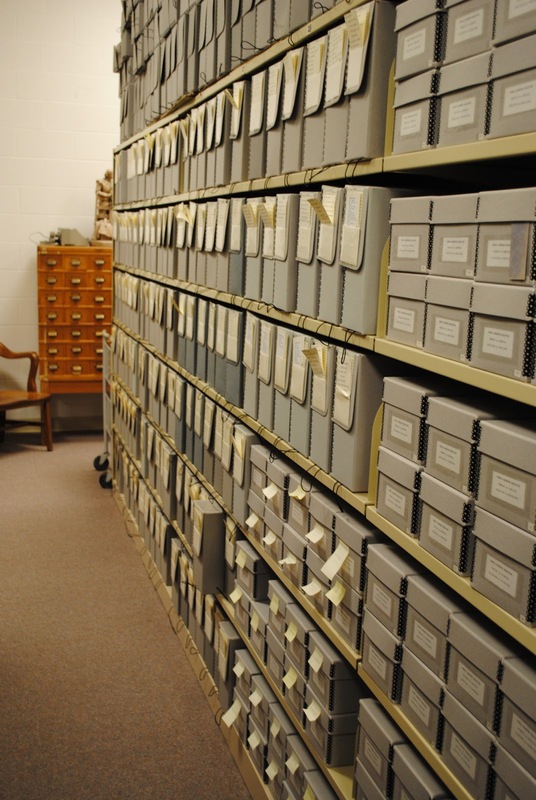 I want to use this blog post to give people a peek into the vault itself, and an idea of the special or unusual records that are available in its depths. The Lambton Room's vault is equipped with special equipment to maintain constant humidity and temperature. These environmental conditions are essential to the longtime preservation of our historic materials. I imagine old newspapers heave a sigh of relief as they are unloaded from dusty attics and carefully stored in this special environment! 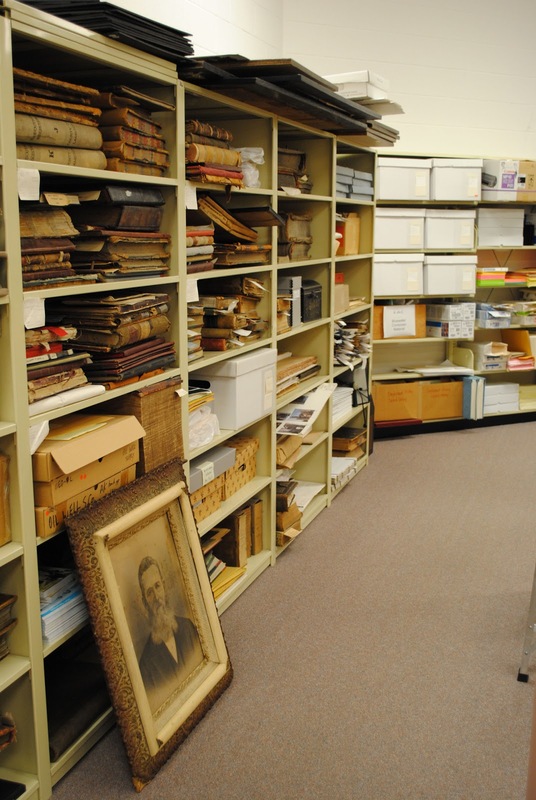 We have over 770 boxes full of file folders containing the records and history of Lambton Room. 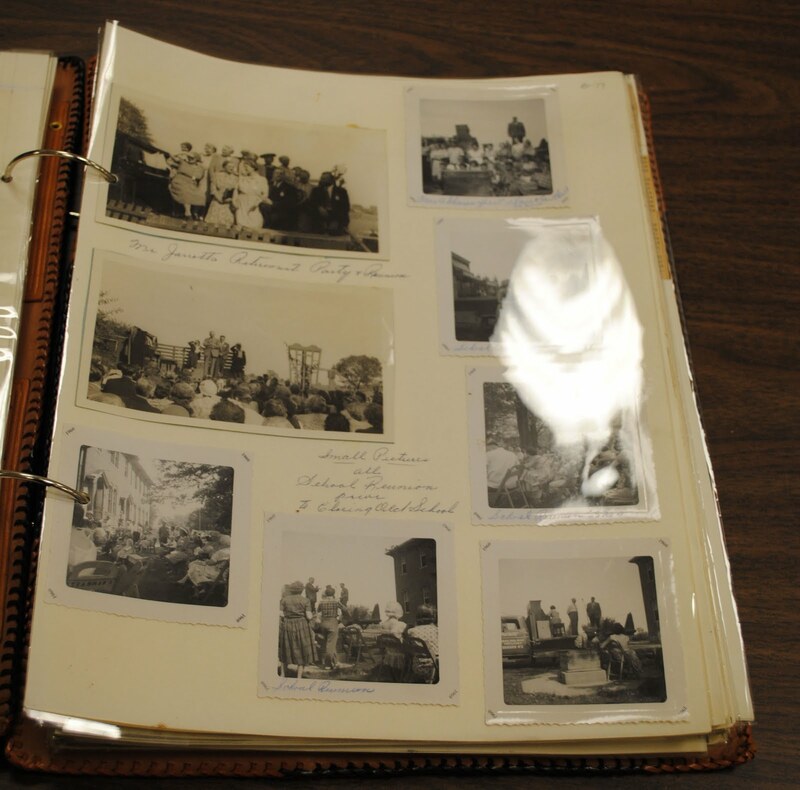 Our photograph collection alone boasts 127 boxes of pictures. 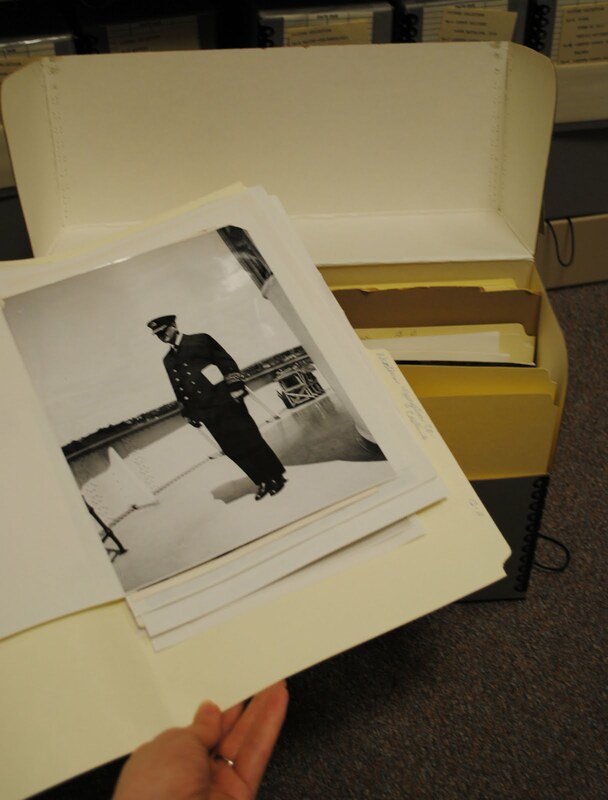 On the left is a shot of the photographic collection, and on the right is a sample of the interior of one of the gray boxes. That particular example comes from our Shipping section, and features Captain Peter McKay, who helmed the Noronic from 1931 to 1935. 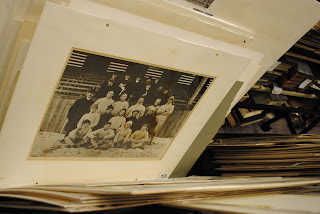 Our vault also has an excellent collection of over sized pictures, including this shot of the Sarnia Rugby Football Club from 1903! Van Tuyl and Fairbank, c. 1908. One of our most imposing collections comes from one of Lambton County's most well-known businesses. 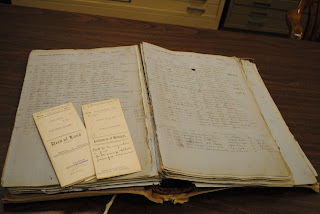 The day books (or account ledgers) from Van Tuyl and Fairbank's successful hardware store are hefty volumes that diligently track the business's transactions. This important slice of Petrolia history provides insight into the hardware industry and the manner business was conducted over one hundred years ago. Our vault preserves not only the records of big businesses, but also the everyday thoughts of ordinary people. 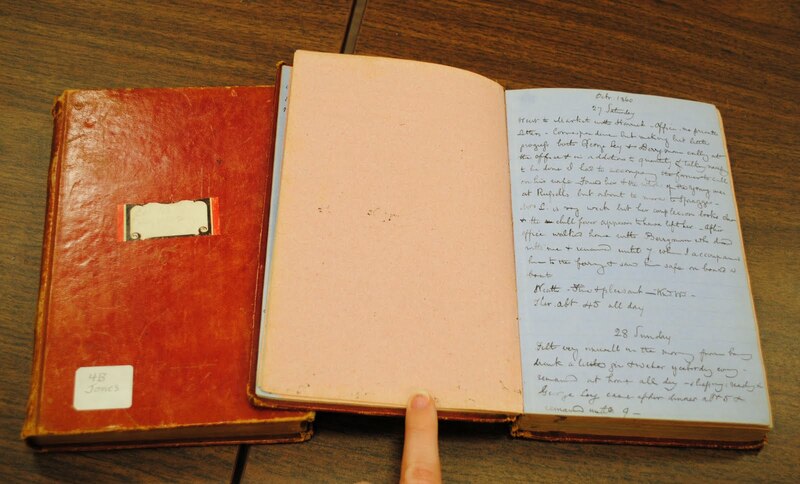 We have a variety of diaries, journals and letters, some written by notable citizens and some penned by Average Joe. To the left is an image of two of the Jones diaries, one of our most significant journal collections (over two dozen volumes). Featured here are entries from October 27 and 28 1860, which included details about going to the market, seeing a friend off at the ferry, and suffering from indulging in too much gin and water. 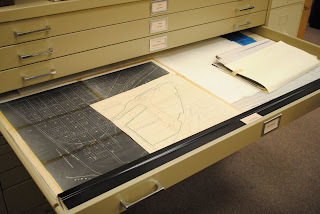 Another important section of the vault is our map cabinet. It is organized by region and date and contains maps from diverse time frames spanning across the entire county. Some maps are merely sketches produced by intrepid citizens; others are detailed fire insurance plans that display main thoroughfares and side streets in impressive detail; still others are old publications from the Ministry of Transportation. Featured here is our Point Edward drawer, and the small map at the top of the pile is entitled "Proposed Development of Railway Land" (revised October 1958). Another significant resource housed safely in the vault is land records for the county. 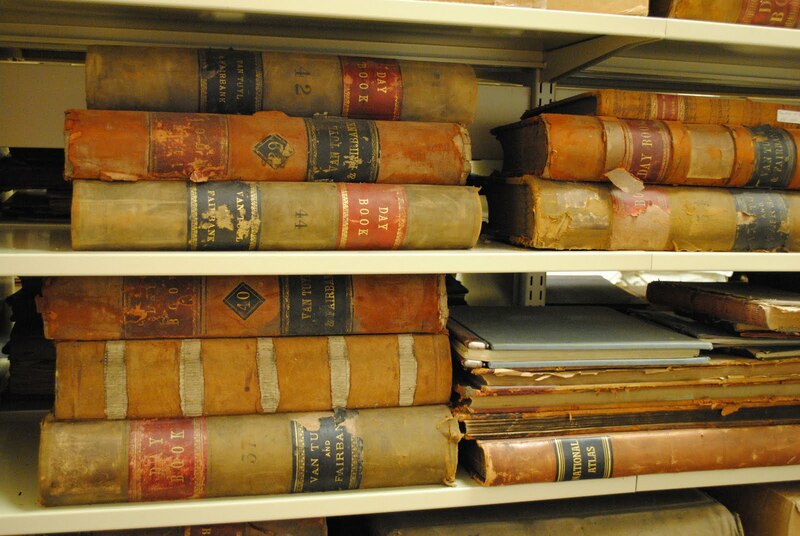 Land records beginning as early as 1850 and extending as late as 1950 can be found in our vault. These land records are listed in unwieldy abstract books (see left) that track all transactions performed on a given lot and concession. The abstract pictured here is open to Lot 13, Concession 10 in Enniskillen, and lists a transfer from the Crown to Archibald Grant on August 10, 1835 as the first transaction on that piece of land. Sitting on top of the abstract book are a Deed of Land and Assignment of Mortgage. There is also a growing collection of Tweedsmuir Books, accompanied by other material donated by Lambton County Women's Institutes. 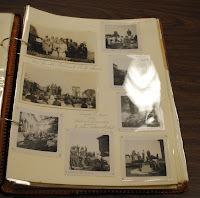 The Federated Women's Institutes of Ontario (FWIO) had an interest in compiling and preserving local histories, and the Tweedsmuir Books became one of the primary vessels for doing so. Lady Susan Tweedsmuir, wife of the Governor General of Canada, was president of the FWIO from 1936 to 1940, and encouraged fellow members to expend more effort in recording and preserving local history. 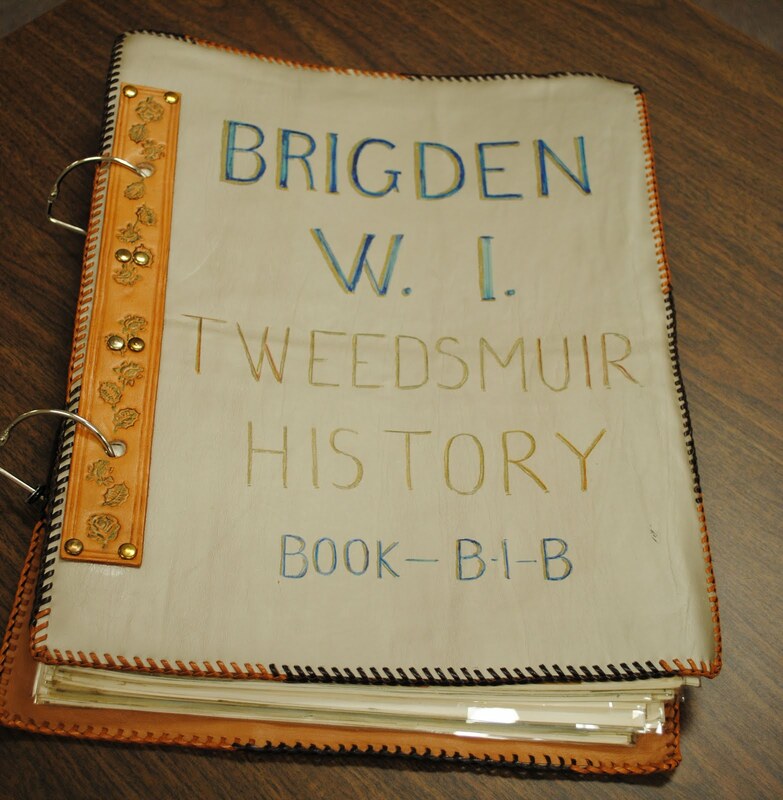 After 1940, the histories gathered and produced by Women's Institutes were dubbed the Tweedsmuir History Books. The Lambton Room is fortunate to have some of the Tweedsmuir Books from Women's Institutes around Lambton County. They are an invaluable snapshot into local histories. The Lambton Room is fortunate to have received so many wonderful donations over the years. These donations are the lifeblood of our collection, give us the opportunity to care for and preserve Lambton County's history.